So, it seems easterbunny has one of these growing inside of her. 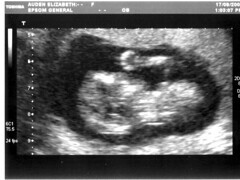 We've sort of known about it for a while but we actually got some pictures today, having popped to the local hospital. B has more to say since, y'know, the kid is growing inside of her, but I'm grinning from ear to ear right now. You see these strange blurry photos with the seashell shaped picture captured from the ultrasound all the time but the stills don't really do it justice. Seeing limbs move, the heart beat. It became real today. That's not a microphone, is it? Or are you having a rock star baby? Big huge congrats, anyway, I'm delighted for you both. Apparently it costs £160,000 these days, to raise a child to the age of 18. FRom ex-co-worker fathers, I relay the handy advice "sleep as much as you can in the next six months, because for the 12 months following the birth, you're not going to get more than fifteen minutes of uninterrupted sleep". Congratulations on your upcoming career as "father", btw. May I offer you personally as father-to-be a hearty woo! and yay! and all the very best. If you turn your head to the left it looks like he/she/it is sucking its thumb. Although if you turn your head to the right he/she/it looks like an angry spaniel. Congratulations to you too, dude. Even without the ABC of Redneck Rock.